Note: this install is shown on my 1997 Cobra. Fox owners will have more work involved with accessing the shifter bolts due to console interference. You can grind the console away for bolt clearance with a dremel tool or something similar, or you might remove the console entirely. ’86 & earlier owners will be removing the console for sure. 1. Unscrew the shift knob and remove the shift boot and console cover plate assembly. (Push your fingers into the boot, hook your fingers under console plate and lift up). 2. Remove the factory shift handle with a 10mm wrench. 3. 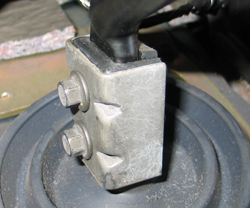 Remove the four bolts (8mm) holding the inner rubber shift boot plate and remove the boot. Here is a closeup of the main reason the factory shifter feels rubbery; the handle is isolated in rubber (imagine that!). 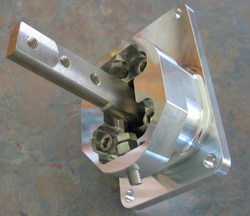 This keeps the shifer handle quiet & gives the trans a smooth feeling while shifting, but is not the best way to a direct connection while changing gear ratios, especially during the heat of battle. My ’97 Cobra has only a few ticks over 50,000 miles, but man, does the grime accumulate. 4. Remove the four bolts (13mm) holding the factory shifter to the transmission. Remove the shifter from the transmission. You may have to pry the shifter from the transmission because the adhesive sealant bonds the shifter to it. 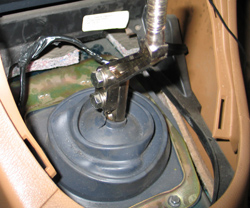 A quick blow to the base (not lever) with a block of wood will break the shifter free without damaging it. 5. 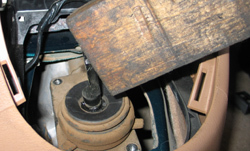 Make sure the plastic bushing is still in the transmission where the shift lever moves the gear selector. If it is not there, look for on the end of the shifter, as sometimes it comes out still attached to the lever. 6. 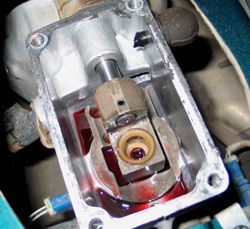 Scrape any remaining gasket material off the transmission and clean off any oil or dirt. 7. 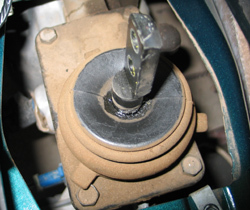 Make sure the plastic bushing is still in the transmission (see step 5). 8. 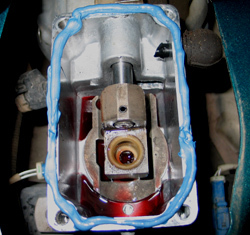 Apply a bead of silicone gasket maker to the transmission mounting surface. 9. Install the new shifter using the new bolts provided (8mm x 1.25 x 20mm long stainless steel). Don? ?t reuse the factory bolts, they are too short for the new shifter. b) Place the shifter in first gear and thread the stop bolt towards the shift lever by hand until it contacts the shift lever. 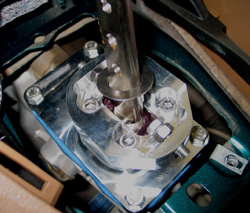 c) Once the stop bolt contacts the shift lever, back off the bolt 1/4 to 1/2 turn, until there is a small air gap (about .015″) between the shift lever and the stop. 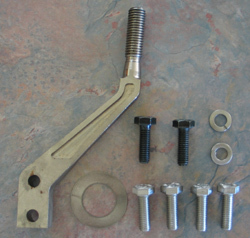 d) Hold the bolt with a 1/2″ wrench while tightening the jam nut against the shifter tower with another wrench. 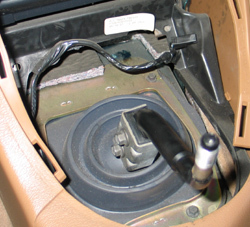 e) Double check the space between the shift lever and the stop bolt. When you pull hard on the shift lever it should contact the stop bolt, but when you let go of the lever it should not touch the bolt, but have a small air gap between them. f) Place the shifter in second gear and adjust the other stop bolt. g) Shift the shifter through all gears and double check the stop clearance in each gear. 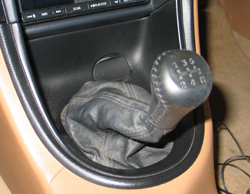 The shifter must be able to shift freely into all gears and rest in gear without interference from the stop bolts. 12. Place the inner shift boot over the shift lever until it rests on the BootGuard. (This is the rubber boot which bolts to the transmission tunnel, not the rubber boot which was attached to the factory shifter.) Reinstall the inner boot with the four factory bolts. 13. Install the new shift handle at the desired position with the two bolts (8mm x 25mm long) and lock washers provided. Tighten bolts securely with a wrench. It is recommended that the handle be installed in the higher position for the greatest driver comfort. For the shortest throw, install the handle in the lower position. 14. Install the console cover plate, shift boot and knob.